Industry Experts unveiled the new market research report on Alternative Sweeteners. The new report titled ‘Alternative Sweeteners – A Global Market Overview’ reveals that the Asia-Pacific market is estimated the largest consumer of alternative sweeteners (HIS and Polyols) accounting for slightly over half of the global consumption in 2017 and the same anticipated to increase through to 2022. The similar phenomenon is expected to witness in terms of market value too. While this report gives an overall market analysis of alternative sweeteners globally, recently released independent reports on High Intensity Sweeteners and Polyols provides an in-depth analysis of the global markets. Alternative sweeteners´ demand is anticipated to increase in the coming years is also buoyed by approvals of high intensity sweeteners and polyols in food and beverage applications by majority of the countries across the globe. Most of the alternative sweeteners are approved in North America, Europe and Asia-Pacific while very few of them are either banned or approved for restricted usage. This report analyzes the alternative sweeteners global markets including North America, Europe, Asia-Pacific and Rest of World in terms of both volume in metric tons and value in USD for the 2014-2022 analysis period. The regional markets further analyzed for 13 independent countries across North America – the United States, Canada and Mexico; Europe – France, Germany, Italy, Spain, the United Kingdom and Russia; Asia-Pacific – China, India, Japan and South Korea; and Rest of World – South America, Middle East & Africa and CIS Countries (Excl. Russia).The market is analyzed in all of these major regions by alternative sweeteners product category (HIS and Polyols), key countries and by major end-use applications in terms of both volume and value. This report also explores the market by product category and major application sector for each major country. The global key market trends are illustrated along with the recent major business trends such as product innovations/launches, mergers and acquisitions etc. Polyols dominate the global market for Alternative Sweeteners by product category, forecast to be 1.6 million metric tons in 2017 accounting for over 90%, which is projected to reach 1.9 million metric tons by 2022 growing at a CAGR of 3.4% between the two years. 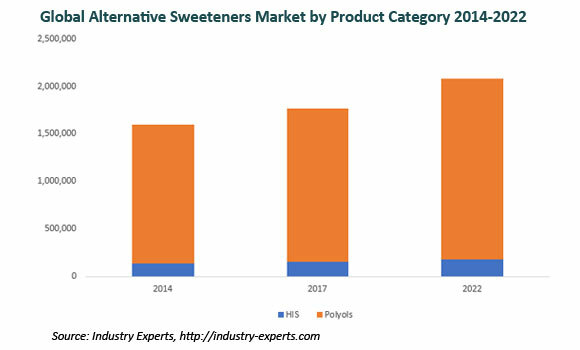 High Intensity Sweeteners accounts for the remaining market share of Alternative Sweeteners and expected to witness the growth rate of 3% during the same period. High intensity sweeteners (HIS) analyzed in this global market report is segmented by HIS category – Artificial HIS and Natural HIS. These HIS categories further segmented in to Artificial HIS – Acesulfame-K, Aspartame, Cyclamate, Neotame, Saccharin and Sucralose; and Natural HIS – Steviol Glycosides (stevia extracts), Glycyrrhizin (licorice root extracts) and Mogroside V (monk fruit extracts). The study also explores the key end-use applications of high intensity sweeteners including Beverages, Confectionary, Foods, Tabletop and Others (personal care, pharmaceuticals and nutraceuticals etc.). Polyols analyzed in this report comprise sorbitol, xylitol, mannitol, maltitol, erythritol, isomalt and lactitol. The polyols´ end-use application markets analyzed include Confectionary, Food & Beverages, Personal Care and Others (Pharmaceuticals and nutraceuticals). Sorbitol market estimated in this report does not include sorbitol used as an intermediate in manufacturing Vitamin C.
This 452 page global alternative sweeteners market report comprises 417 charts (includes a data table and graphical representation for each chart), supported with meaningful and easy to understand graphical presentation, of market numbers. The study discusses the regulatory framework of polyols and high intense sweeteners market in all major regions of the world. This report profiles 39 global players and 135 overall major players across North America – 25; Europe – 13; Asia-Pacific – 95; and Rest of World – 2. The research also provides the listing of the companies engaged in manufacturing and supply of alternative sweeteners. The global list of companies covers the address, contact numbers and the website addresses of 260 companies.